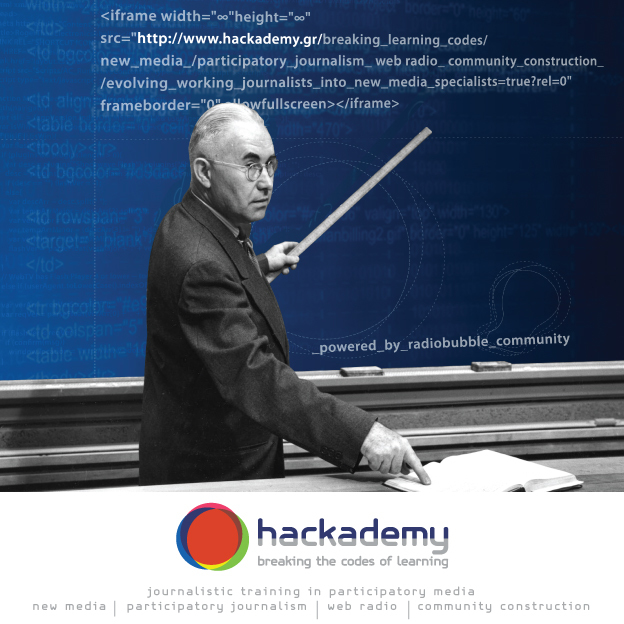 After five years of navigation in the webclouds, radiobubble is proudly presenting Hackademy, a strain originating from the community, aiming at training professional or non-professional journalists about new media and the web radio. Since September 2007 when we first started, until now, we have acquired knowledge about how new media can be accurate, trustworthy and efficient. We have also produced results that changed the up to then impression about what the new media are, but also about the practical definition of “citizens’ journalism” and “web radio”. Radiobubble itself started as a “weird hybrid”, that was never met before in international literature. People uploading podcasts on a common website, was already happening. But people creating radio shows and uploading them on a website, transforming it gradually to a “radio community” with evident cohesion was a premiere. On the other hand, there were several web radios, even with a community culture, especially abroad. But combining the “modern way” of a live radio programme with the “vintage way” of uploaded shows, played in the programme, was completely new. It’s even more interesting that later on, it turned out that an open web community with neither structure nor conventional media hierarchy (directors, editors in chief etc), managed to completely change the impression we used to have about radio, and produce very high level content –a completely opposite to the mainstream radio one. Playing music which is covering the entire spectrum of human creativity and practically ignoring commercially specified "expertise", defined by the "kind" of music or the date of production, radiobubble redefined “radio" in the new era, without getting trapped by the facilities of playlist and "automation" which prioritizes "conventional models" whose main objective is commercial profit. De facto, importance was given to the personality of the people behind the microphone, and se we found ourselves at the threshold between the past and the future of Greek and international radio. This communication produced theater pieces, radio documentaries, created only to be played by radiobubble. We ended up scanning the hazy field, where radio show is approaching the art. The use of language, especially the Greek language, in a new media traveling in the chaotic sea of the web, where in theory everything is allowed, but also everything can vanish because of the huge load of information, is a constant challenge. As radiobubble was more and more connected to the culture of reliable blogs, the culture of the so called “thinking web”, the living written web “new language”, started finding its volume and becoming a radio show. Music and art cannot be conceived without being connected to what’s happening in the society: it was therefore normal that we were led to create new forms of communication, innovation related to journalism. Swooping by the culture we had already created via our everyday abrading with all the above mentioned terms, ideas and values, we created the first open pole of citizens’ journalism in Greece. It operated around the web community that is transmitting news via twitter, using the hashtag #rbnews. This community, though open, manages to define itself by its code of conduct and declaration of principles, which always and on purpose remain under readjustment. As we were steadily and more and more often invited to academic conferences and workshops, asking us to explain “how we do it” and to analyze the “recipes” and “methods” of creating a web community, a web radio with the above characteristics, but also the construction of a citizens’ free and serious team is producing journalistic results, we started codifying in a systematic way our knowledge. We soon realized that the best way would be that we all take the responsibility to transfer it to anyone who is interested and us willing to learn. And while checking the CVs of those participating in the radiobubble community, we realized the high level of scientific training and professional experience we have as a team. Hackademy is the natural result of the above. Its basic target is to constitute the epicenter of interaction of the three key poles of the information “ecosystem”, namely the civil society, the professional journalists and the academic society. So we had to define as the main characteristic of Hackademy, that “it’s breaking the codes of learning”, which is accompanying its brandname. Developing its curriculum is the result of months of hard work by @galaxyarchis, Apostolis Kaparoudakis and @doleross. Its current form is a draft, more names will soon appear on the page of contributors, while we also plan to create its library. It’s going to be the center of scientific knowledge that will be open to anyone and will constitute a useful tool for all those face journalism and new media with great interest. The first classes are scheduled to start by October 2012. For the moment, we are doing our best so as to minimize their cost, without compromising the quality of the offered knowledge. We would like to thank Mind_TheGab for creating the logo and the poster of Hackademy, and also his help to improve the website.